Environmental Law Monitor – No Straw for You! 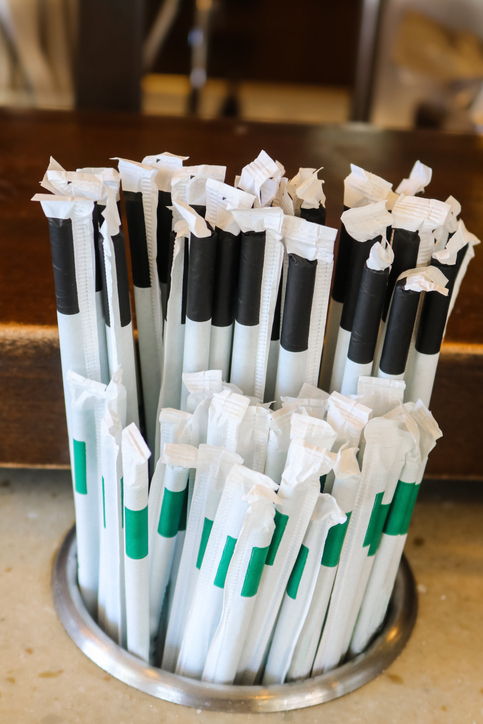 On January 1, 2019, the District of Columbia and the State of California became the latest jurisdictions to ban restaurants from offering their customers a plastic straw and other single-use plastics, including coffee stirrers. Seattle and Vancouver have similar straw bans in place and regulations are now proposed or pending in New York City, Miami Beach, Fort Myers, and Monmouth Beach, among others. The straw ban movement has expanded beyond the U.S. and Canada; the United Kingdom proposed a ban on selling plastic straws, stirrers and cotton buds, Queen Elizabeth II banned these plastics from all Royal Estates, and Scotland plans to rid itself of the plastic straw in 2019. By 2030 you should not be able to find plastic straws, cups and bags in Taiwan. In California, the new anti-straw statute limits full-service restaurants from giving out single-use straws, unless requested. Fast food restaurants are not subject to the ban. Violators of the new California law could face a daily fine of $25 and up to $300 annually. Aside from governmental action, private industry has joined the movement. California based Bon Appetite is slated to eliminate straws from over 1,000 of its cafes in over 30 states, McDonalds will discontinue straw use in its UK and Ireland restaurants. Alaska Airlines is going to a paper straw, Marriott banned straws from all 60 of its UK properties, and Starbucks, Hilton, American Airlines, and Ryan Air are setting target dates for straw elimination. In January, 2019 National Geographic published an article to highlight the straw ban movement and detail both the history and development of the straw and the environmental hazards of this plastic piece of history. National Geographic pointed to National Park Service estimates that on a daily basis over 500 million straws and stirrers are used in the U.S. alone. According to this article, on an annual basis eight million tons of plastic waste flows into the oceans, and straws consist of .025 percent of that pollution. A discussion on CNBC with Ayana Elizabeth Johnson, a marine biologist, revealed that “[w]e’re on track, if we keep polluting as we are, to have more plastic than fish in the Ocean by 2050.” In addition to pollution, the plastic straws have injured and killed wildlife. The plastic anti-straw movement, however, is not without detractors. In a recent Bloomberg Opinion article, author Adam Minter states that “this well-intentioned campaign assumes that single use plastics, such as straws and coffee stirrers has much to do with ocean pollution.” According to Minter, this assumption is based on suspect data from a survey conducted by a nine year old. Minter submits that most of the plastic pollution is from commercial fishing gear and nets, not straws. While debate will continue about whether the anti-straw campaign is based on junk data, awareness, or legitimate environmental concerns, in the end there may be no straw for you.